Get noticed for your stunning complexion — not for your makeup. This lightweight, silky formula primes your skin and temporarily neutralizes the appearance of discoloration, making your complexion look velvety-smooth and flawless. So you'll get noticed for all the right reasons. Ingredients: Cyclopentasiloxane, Dimethicone Crosspolymer, Cyclohexasiloxane, Dimethicone, Tocopheryl Acetate, Cymbidium Grandiflorum Flower Extract, Aloe Barbadensis Leaf Extract, Carthamus Tinctorius (Safflower) Seed Oil, Cymbopogon Schoenanthus (Lemongrass) Oil, Glycine Soja (Soybean) Oil, Ethylhexylglycerin, Methicone, Caprylic/Capric Triglyceride, Retinyl Palmitate, Ethylhexyl Salicylate, Talc, Caprylyl Glycol, Hexylene Glycol, Phenoxyethanol, [+/- Titanium Dioxide (CI 77891), Iron Oxides (CI 77491, CI 77492, CI 77499), Chromium Oxide Greens (CI 77288), Manganese Violet (CI 77742), Ultramarines (CI 77007), Yellow 5 Lake (CI 19140)]. Have tried many primers of different brands, even like one or two. 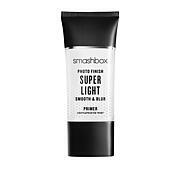 But I LOVE this Smashbox primer!I chose this particular one because it was tinted and evened out skin tone. Gives my face a flawless canvas for makeup. This product is one of my essentials!! Makes my face feel n look so silky!! This amazing stuff makes your face appear flawless and camera ready. Smooths your skin and makes your makeup go on evenly. Reduces pores and shine. Will purchase again. This primer looks like a pink pearlish color giving no discoloration coverup under foundation wear... 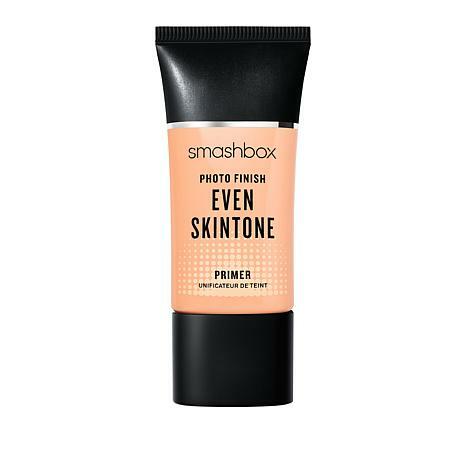 Such as Skinn "product primer from Evine which is 20.00 and excellent but out of stock, which gives your a flat flawless coverage whether you feel like wearing foundation or not. This stuff goes on liquidy does nothing to fill in lines. Will be returning this greasy feel zero coverage flaw primer.